Ms Saw Phaik Hwa seems to have missed entirely the concerns which commuters may have about crowded trains and stations. She seems to be of the opinion that the issue is simply about ferrying commuters from Point A to Point B in the shortest possible time. She seems to think that the solution is a rather simple one: that commuters should “push” themselves in if trains are crowded, as she admitted doing so herself. She is missing bigger concerns here – the safety and security of our trains and stations. While overcrowding has given rise to frustrations and unhappiness among commuters who hope to get to their destination in time in a fairly comfortable manner, transport operators should be more aware of the safety and security concerns which are exacerbated by packed trains and stations. For a start, the more people there are in a station, for example, the harder it would be for security personnel to spot would-be trouble-makers, terrorists included. Just a few days ago, I was at Orchard station with a friend. Both of us were looking for security features or security personnel. There were virtually none. And this is the situation not only at Orchard station. The same is seen elsewhere, in particular City Hall, Jurong East, Yishun, etc. The crowds inside these stations are substantial. My friend and I at Orchard station asked ourselves, “What if a bomb went off here?” The consequences would be terrible for sure – but it would be exacerbated given that stations are bursting at the seams, packed as they are with commuters. There would not only be casualties from the explosion itself but also inevitably from the resulting stampede of people. And then remember this: it is not one crowded station we are talking about here. 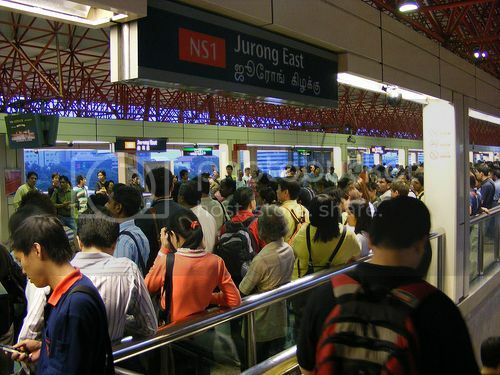 It is virtually all major stations throughout Singapore. Each of them is a convenient target for terrorists who, one can imagine, would target stations which have the most number of people, for maximum impact. And with the many stations which are overcrowded, security personnel are stretched to the maximum as well. In 2009, Workers’ Party chairman and Non-constituency MP, Ms Sylvia Lim, again highlighted the concern. Without counting the added demands of having the casinos, she said, “this study confirmed work overload and understaffing in several areas, even before the casinos are functional.” She was referring to the Ministry of Home Affairs’ own study, “Human Factors”, on operational fatigue on the officers of the Home Team. What about Transcom, the security outfit which was set up in 2008 to specifically deal with transport security? Overcrowded stations and trains are death traps. How much have we learned from the bombings of London and Madrid? Or have we learned anything at all? And contrary to what the government has said, security of our stations and depots are not, should not and must not be the responsibility of the transport operators. And how well-prepared our security personnel are, is an open question, going by what the Law Minister himself said. I do not recall Ms Saw showing or being concerned about this matter. She seemed to be more concerned about the “maintenance” of the trains themselves! In light of the recent security breaches at Changi depot and the escape of terrorist-suspect Mas Selamat, one wonders how seriously the authorities take security issues. If ever a bomb should go off – and this is no far-fetched imagination as the Jemaah Islamyah’s targeting of Yishun station has shown – no amount of “review” of our security system would comfort the families and those who are victims. The arrogant attitude of Ms Saw, as displayed through her remarks about crowded trains, leaves one wondering if she is the right person for the job – or if she is even aware of the wider implications of overcrowded stations and trains. Read also: Singapore Police Forced – stretched and fatigued.